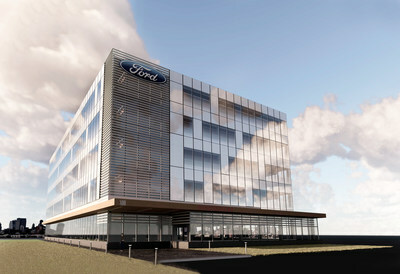 QUEBEC CITY, Dec. 19, 2018 /CNW/ – Cominar today announced that Ford has signed for 40,000 square feet at 800 Palladium Drive at its Palladium Campus in Kanata, Ontario. The new building will be home to one of the automaker’s most sophisticated research and development centres, with more than 300 new specialty engineering jobs will be created as a result. Recognizing pent-up market demand, Cominar identified an opportunity to develop its phase 4 building at its Palladium Campus. Its strategic location near several major thoroughfares in central Kanata, as well as a park like setting and fully serviced office campus, make this campus an ideal choice for future occupants looking to offer leading edge amenities to its employees, as well as tremendous branding opportunities onto the 6-lane Queensway highway. The five-storey, 100,000-square-foot building will be ready to accommodate its first occupants in fall 2020. A number of leasing opportunities are still available, including 50,000 square feet of office space and 10,000 square feet of retail space. Future tenants of the new Class A building will have access to a wide range of state-of-the-art amenities, including multipurpose training and conference rooms, fitness and yoga facilities, and secure indoor bike storage. Outside features will include a deck space with a barbecue, agora, volleyball court and a parking lot for more than 330 vehicles. With the Palladium Campus concept, Cominar will be welcoming such prestigious companies as Calian, KPMG, Sullivan and Orbcomm to its roster of tenants. The flexible, innovative nature of the units will undoubtedly contribute to the overall efficiency of their operations. This new development project is in keeping with how Cominar plans to implement its corporate vision to help optimize its clients’ growth and enrich the experience of the occupants of its properties and the customers they serve. Cominar is one of the largest diversified real estate investment trusts in Canada and is the largest commercial property owner in the Province of QuÃ©bec. The REIT owns a real estate portfolio of 429 properties in three different market segments, that is, office properties, retail properties and industrial and mixed-use properties. Cominar’s portfolio totals 38.2 million square feet located in the Montreal, QuÃ©bec City and Ottawa areas. Cominar’s primary objectives are to maximize unit value through the proactive management of its properties.